While I was looking at all the concepts from Sony's design competition at SlashPhone, I came across this little baby, buried among the others. Notice how, at the lower bottom of the picture, the phone is compared in size to a standalone PSP. In the model's hands, the device looks maybe a little too big to be a proper phone - but I think you could make it just a bit smaller and still get good gaming functionality. Notice also that it seems to have a dual screen - one top and one bottom - similar to the Nintendo DS. A device like this would sell in the millions - and be what the N-Gage should have been and never was. 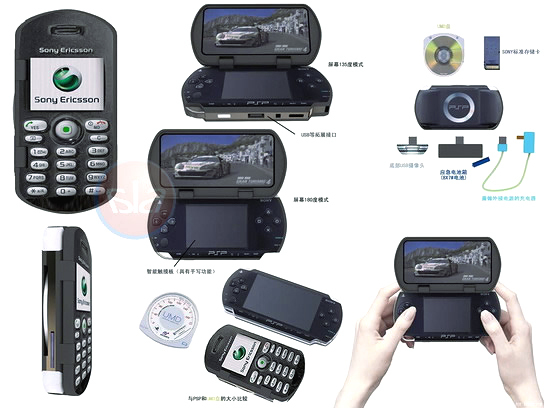 Will Sony Ericsson follow up the PSP in a few months with a PSP phone very much like this one? Who knows. But they'd be crazy not to. This thing is brilliant. They really ought to hire the guy who did this - if they haven't already.